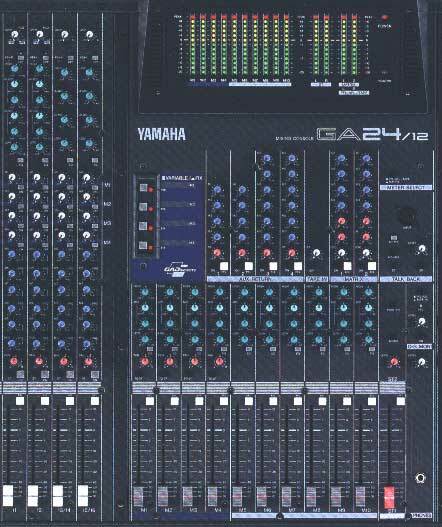 Yamaha GA24/12 mixing console with flexible bus architecture. Free data sheet by GB Audio. Yamaha mixing console with flexible bus architecture. 20 mono input channels, each with: 48v phantom power, gain, pad, Ø, HPF, four band eq (2 mid sweeps), eq bypass, pan, channel on/off, PFL, 100mm fader. 2 stereo line input channels, each with: gain, HPF, four band eq, eq bypass, pan, channel on/off, PFL, 100mm fader. The aux and group routing is flexible. There are at least six auxes (switchable pre/post in pairs). Four Diversity buses can be individually switched to be either sub groups or auxes making a maximum 10 auxes plus LR. (Or 6 auxes + 4 sub groups or 7+3 or 8+2 or 9+1). Each of the 10 group/aux buses has a three band eq (sweep mid) making it ideal for monitor mixing or various FOH applications. The master section has 4 aux returns, tape input, two matrix outputs, talkback, control room output and comprehensive LED meterbridge for LR, Matrix/PFL and all auxes/groups.